Making an offer on a property in Port St. Lucie is done just after you’ve found the house that meets your criteria. So if you’ve made it this far, congratulations! Hopefully looking at houses has been an enjoyable experience. If the market is busy and there are a lot of buyers you don’t want to wait too long to make an offer. I’ve showed houses to customers where the property was available with no offers the morning we toured and by the time we wrote up an offer at the office that afternoon we learned another offer had come in! It’s good that you’re doing research on this process but keep in mind that there are local customs and trends so if you’re not from the Port St. Lucie area then how an offer is made in your area could be different – consult your trusted real estate agent. Do you offer what they’re asking? How long has the property been on the market? If it’s a new listing the seller may not be as negotiable in price. If it’s been on the market for 30 or more days then the seller may consider taking less than what they’re asking. Are there multiple offers? If there are other buyers who have made an offer then you might have to be more competitive in your offer price. Is this a short sale? The seller may accept your below-listed-price offer but remember that their lender has to accept the offer price and you could be waiting 30 to 90 days to get an approval. As a side note, in the Port St. Lucie area we’ve seen short sale lenders want a contract price pretty close to market value. The days of “stealing” a house are long gone. Once you’ve reached an agreement on what you will offer the next step is to draw up the paperwork and have all parties sign. Commonly the property is listed “As Is” so your agent will be using the Florida AS/IS Residential Contract For Sale and Purchase which is 10 pages long. There are addenda that are typically added to the offer such as Mold Addendum, Defective Drywall Addendum, and maybe a Short Sale Addendum or Home Owner’s Association Addendum. You will also need to provide proof of how you will pay for this property. If you’re buying with cash you’ll need a bank statement or letter from your bank showing your name and either a balance or proof that you will be able to cover the offer price. If you’re purchasing with a mortgage you’ll need a pre-approval letter from your lender stating that you qualify for a mortgage that will cover the offer price. To show that you are serious about purchasing the property you will want to make a deposit. There are no set rules but usually the minimum is $1000 for a buyer purchasing with a mortgage or 10% for a buyer paying cash. This deposit can be made with the offer or after the seller accepts the offer – either way it will be specified on the first page of the offer so be sure to bring your check book! Curious to know what an offer looks like? Click here to view an example. Your agent (which is hopefully me) will email, fax, or hand-deliver your offer to the listing agent. On the first page of the offer was a specified deadline in which the seller should return their decision. I typically specify within 24 hours. Sometimes it takes longer than that for a foreclosure. Hopefully the seller accepts your offer on the first shot. But if not then you’ll probably find yourself negotiating with the seller (through the correspondence of both agents involved). If the seller comes back and says they don’t accept your offer, but they present an alternative choice, then this is called a counter-offer. If you like this counter-offer, accept. If not, you can present your alternate offer, or counter-offer their counter-offer. This going back and forth can be tiring and frustrating but stick with it because buyers and sellers usually will come to favorable terms for both sides even if it takes 2 or 3 times. 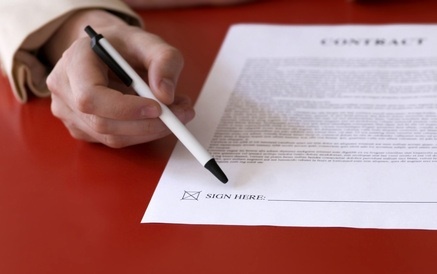 Once all parties agree to the terms then the offer is now considered a bi-lateral contract. Congratulations! If it’s a regular sale or a foreclosure sale (not a short sale) then you would follow the timelines set forth in the contract to get your inspection done. The effective date is the date that all parties have signed and all parties receive notice that all parties agree. If your contract says you have 10 days to do your inspection then you would have 10 calendar days from the effective date. If this is a short sale, the effective date is typically the date that the seller’s short sale lender delivers written notice to you that they have accepted the offer. Are you ready to start the process? Click here to start a conversation about what you’re looking for or call Sarah directly at 772-485-3214. Please be advised that this article is not legal advice. If you have legal questions about making an offer or how to handle a contract please consult with a professionally licensed real estate agent or with an attorney. The descriptions and anecdotes in this article are from personal experience and should not be taken as fact. The video of the inspection was awesome – that helped us to understand what they were doing.